Anyone who has seen me, spoken to me, or tweeted with me since the interim LEDER report was published has had to listen to me raging about the utterly demoralising contents. 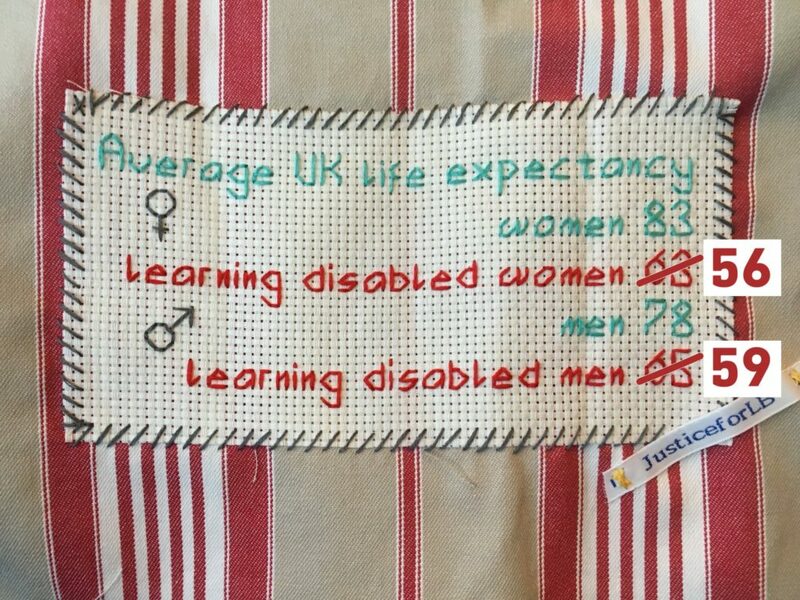 I’ve yet to actually take my needle to canvas to stitch the new and (not in the slightest improve) premature mortality statistics. Instead of stabbing canvas, sorry stitching, I’ve been putting my rage to good use and have spent several hours gardening, pulling out weeds and plants, digging through mud and relocating my resident slugs and snails to another part of my neighbourhood. "We went in the hospital with our daughter for an eye operation and came out with a death certificate. "BBC Breakfast has heard concerns that malnutrition may have contributed to death of 21 year old Laura who had learning and physical disabilities.We shared those concerns with a coroner who has now ordered an inquest. The coroner decided today he wasn’t going to rush at anything, so he has yet to decide whether Article 2 is engaged. This leaves Laura’s parents waiting for another PIR. The glacial pace of coronial progress. On a more positive note Amanda and Andy McCulloch had a massive #JusticeforCol breakthrough this week. Their legal team (Merry Varney, Caoilfhionn Gallagher, dream team) sent a letter before action to Coroner Pears stating their intention to take him to Judicial Review on the grounds of bias and delay of Col’s inquest. Coroner Pears requested additional time to consult with his lawyers (nothing like an efficient coronial process, no, nothing like it) and has now recused himself, that’s stepped aside to you and I.
I’m heading up to Cheltenham on Friday night to attend FestABLE on Saturday. If you’ve not heard about FestABLE and can make it do take a look and pop along if you can. I’m having one of those mild imposter syndrome panics about why I’m on a keynote panel with two men called Nigel (I’m already the blacksheep by being a George) talking about Good Intentions, Good Enough? Christine Lenehan’s report on residential schools and colleges published in 2017. I’m going to be honest this was the sort of gig I dreamed about years ago, but these days I feel woefully out of my depth. I don’t know anything about SEND legislation, except what I hear on social media about it going wrong. Twenty years ago I was bright eyed and bushy tailed and sitting my finals at Cardiff University. Little did I know that a couple months later I’d fall on my feet with an ESRC fully funded PhD looking at curriculum and educational provision for children and young people with profound and multiple learning disability. I had the enthusiasm and optimism only a 21year old has. I lived and breathed that research for four years, the final one overlapping with my first year as a university lecturer. During my time at Cardiff I volunteered weekly with an organisation called CUSS (Cardiff University Social Services). I did loads of things, spent time with learning disabled people who had left Ely Hospital, decorated for older people in the community, provided respite for a severely autistic young man. I learned almost as much from that time as I did from my lectures. Next year it will be 50 years since the abuse at Ely Hospital was uncovered and a decision made to shut the hospital, that’s more years than I’ve been alive, and yet in many ways it feels like we’re no further forward. People with profound or multiple disabilities had a median age at death of 41 years. I have a week left before I turn 41. I’m not done yet. It’s inconceivable that a group of people could routinely die at 41 and no-one really bat an eyelid about it. Still no response from NHS England, from Jeremy Hunt, from DHSC, not even the usual platitudes. The idea that at 18 he might lack credentials for such an initiative was, he later recalled, “a question that never occurred to me”. It was an approach that was to prove highly effective as he went on in his career to tackle, and defeat, powerful forces of inertia that stood in the way of closure of the long-stay hospitals and creation of opportunities for almost all learning-disabled people to live in the community, as they do today. Maybe we should all be more Jim. Having read Lenehan’s report from cover to cover this morning, the challenge hasn’t really moved on in the last decade. Reflecting on the LEDER report there is only one answer to the report’s title Good intentions, good enough? That’s a big fat no. This low level apathy seems all pervasive. A complete lack of ambition. Fuelled by views published in the TES characterising parents as challenging, angry, pandering or non-engaging. I’m left wondering how we got here. I’ll pull together some more coherent thoughts before Saturday but there are a disturbing number of parallels in what goes wrong in education, and health, and social care. We know the challenges. We know the people who are left battling time and again are parents, family members and allies, fighting, while their loved ones are alive, and once they die. Laura’s father said to me today that they never wanted an inquest or any of this fuss, they just wanted answers and wanted to know that things has been changed so other people coming into the hospital were safe. Families don’t want to fight, they just want to love their loved ones. The love that Laura’s parents have for her is palpable, it fills the air when they talk about her. It oozes. They describe Laura as their gift and speak of how their lives will never be the same again. I feel privileged that they shared some of their memories of Laura with me. I know it’s my loss that I didn’t get to spend time with Laura. Much as it’s my continual regret that I never got to meet LB, to share a bad joke with Richard or a cuppa with Danny. I’m not sure where I’m going with this blog post really, it’s just a jumble of thoughts. I want to end with this brilliant film from PAMIS, its not new but it was new to me (thanks to Zoe for sharing), until we all know what profound means, we’ll never fully understand the profound injustice for us all, of people’s lives ending at 41.